Respect, integrity, service, stewardship, and curiosity are Millbrook’s core values. It is no accident that service is at the center of those values, as it has been a vital component to the Millbrook experience since 1931. Millbrook students own the culture of the campus, and community service is a large part of that ownership. Community service is built right into the schedule at Millbrook. Four days per week, for a total of 2 hours, students and faculty devote time to helping the school "run," as well as serve in the local community; however, it's common for students to volunteer considerable time beyond the built-in community service periods. Whether feeding the endangered red wolves at night, teaching music lessons to local children, or taking a Bright Nights Run into Poughkeepsie to provide food and comfort to those in need, service extends far beyond the dedicated blocks in any given day. Service is perfectly expressed in our motto—Non Sibi Sed Cunctis (not for oneself, but for all)—so it is no surprise that one of our most honored traditions is the awarding of the Community Service Cup to a deserving senior at commencement each year. 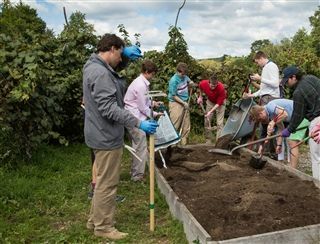 IVth, Vth, and VIth form students remain with a community service for the entire academic year. IIIrd form students participate in three different services on a rotating basis. These students will spend approximately ten weeks in each of the following services: the zoo, recycling, and the farm. Do you want to help plan what you do on the weekend? This service helps in the preparing, planning, and advertising of campus activities that happen both during the week and on the weekend. CS members assist in integrating new activities into the weekend program and in solving logistical concerns of existing activities. Students also help make the weekend team assembly announcements and keep the community informed of upcoming activities. This service may sometimes meet outside of the regular community service periods. Selected students will serve the as head tour guides (HTGs) for the Admission Office. They work closely with admission staff on various activities, including organizing campus tours for prospective students. HTGs are depended on to give many tours during their free periods, as well as to help notify other students of their upcoming tours and make announcements in assemblies. HTGs assist in Revisit Days and other admission events. This position is for those interested in being heavily depended on by the admission office, as well as in being prepared for future leadership positions on/around campus. This position is for a self-starter, and those participating in this commuinity service offering will often be required to work independently during the CS designated times. We would look for it to become an Alumni & Development designated leadership role for a VI form student. Student(s) work with the Director of the Annual Fund (Mrs. Vanecek) and have the responsibility for leading the VI form class transition from student to alumni. This student will graduate with the title of Class Agent. Student(s) will need to have strong communication skills, to be comfortable in a leadership role, and to have a good understanding of Google Sheets, LinkedIn, and technology in general. This community service involves cross referencing Millbrook’s athletic events with other schools. The person selected for this service would utilize information from the web to confirm athletic event dates and times, and report any and all discrepancies to the Athletic Director (Mr. Krauss). This community service will coordinate assemblies, forums, chapel talks, and formal dinner attendance. Members also serve as deans’ assistants to the Academic Office and the Dean of Students office. The service takes on two additional mission-based initiatives each year. This service focuses on maintaining a positive, healthy, and enjoyable experience for students in the Barn and on the weekends. This community service group is responsible for the upkeep of the Barn during peak hours and will hold their peers accountable for keeping the space well-kept. Barn monitors will be tasked with developing ideas and regulations to help maintain the upkeep of the Barn. Monitors will commit to two nights a week before study hall of Barn duty, in which they make sure that the regulations of the Barn are upheld and the space is cleaned. They will also help set up the Barn for events when called upon. Students in this service care for faculty children when faculty are attending to school responsibilities. Thursday night faculty meetings and Saturday morning classes are obvious area of need but others may be identified once the service is up and running. Students in this community service must be approved by a select group of faculty and receive training. Students in this service play a role in supporting the ongoing and critical process of informing students about opportunities for their post-Millbrook educational plans. In doing so, engaging with peers is essential and an integral part of the college counseling community service. 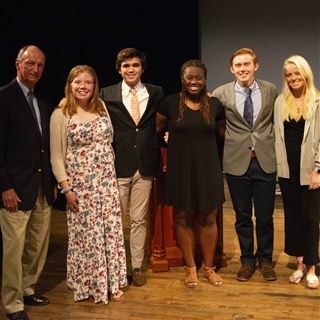 The student(s) in this service should enjoy helping others, be well organized, and have an interest in public speaking, communicating with peers, and engaging the Millbrook community to think broadly about college. Students in this service walk the dogs of faculty members during times when they cannot walk the dogs themselves. Students receive training prior to working with the dogs. Faculty members submit requests to the student leader of this service, who then distributes responsibilities among the students. This community service offering is not available to III and IVth formers. The dorm leaders are selected by the current dorm faculty along with the Dean of Students and the Dean of Residential Life. Dorm leaders provide essential support for maintaining a safe and healthy environment in the dormitories to which they are assigned. They complete dorm duty at least once a week and all dorm leaders meet as a group during the Tuesday Community Service period. Environmental Council promotes sustainability by integrating environmental stewardship into programs, policies, and activities on campus. The Council recommends and implements projects that support Millbrook's mission of stewardship of the natural world and goal of carbon neutrality, which could include energy efficiency and conservation, community awareness and involvement, and renewable energy initiatives. The Council is composed of students, faculty, and staff. Each dorm will have a representative on the Council, who serves as a liaison to enhance community involvement. These students will have a real and meaningful impact on the school in both the short and longterm. The community service may sometimes meet outside of the regular community service periods. Students in this service assist the assigned faculty in helping to run the three evening study hall spaces—Silent Study, the Library, and H-block. Duty consists of two nights weekly. This position is NOT available to III and IV formers. 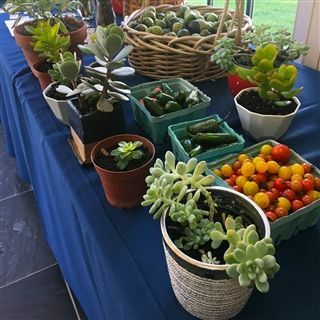 Millbrook maintains a state-of-the-art mobile greenhouse, which supports our commitment to community gardening, composting, and hands-on work. We are growing our own produce and delivering it to our dining hall. Also, we are working on expanding the Millbrook School Farm by adding one acre of no-till field. Required of all IIIrd formers, this service is also open to all upperformers, and has two leadership roles: Farm Curator and Principle Farmer. Want to help keep our buildings all safe? Want to learn about all of the buildings on campus? Want to perform a very important service for the community? If you answered yes to any of these, then the Fire Safety community service may be for you. This service checks emergency lights, fire extinguishers, emergency exits, student rooms for safety, and reports problems to maintenance and dorm heads. The General Services Community Service is responsible for parts of the regular upkeep of the Schoolhouse as well as general services for the entire campus. This includes maintaining all the classrooms and the extensive common spaces in Schoolhouse.Students will do some cleaning of display cases in Schoolhouse, maintain the K-cup coffee station in the faculty room, help set tables for formal advisor lunches on Tuesday, clean the athletic busses, and from time to time engage in other projects as needed around campus. Students in this service help in the Hamilton Math and Science Center by way of maintaining classroom spaces throughout the facility, helping to keep track of math supplies, and assisting the Science Department in maintaining its laboratories and equipment. Students in this service will work closely with the staff of the World Language Department to oversee the operation and maintenance of the Harris-Kenan Language Center. Duties will include downloading international news programming, updating the bulletin boards, and taking physical care of the space. Students who are a part of this service are important to the smooth, efficient functioning of the dining hall. Their work includes, but is not limited to, making sure that students assigned to dishwashing and food serving do their jobs properly and well. This service is a good place to test and develop leadership skills. NOTE: Duty consists of one day weekly: a breakfast meal and a dinner meal. This position is NOT available to III and IV formers. This service provides students with an interest in any element of the arts to acquire new skills or enhance existing ones. Those who are a part of this service will play critical and direct roles in supporting the needs of this multi-faceted facility. You will help to maintain the studio art, music, ceramics, set design, costume, and dance rooms, as well as the Warner Gallery, the Murray Photo Studio, and the Morrison Theater. Students in this service develop the skills to monitor and run the sound and lighting devices in the Chelsea Morrison Theater. The "tech crew" is responsible for audio and video presentations in the theater throughout the academic year. While the obligations during the CS block tend to be light, this service requires frequent work in the evenings and weekends when many of these events occur. In addition to the work that this community service does to support Forums, Chapel Talks, Guest Speakers, and other events, they are also responsible for the general maintenance and upkeep of theater spaces. On occasion, they will be asked to help support the fall play and musical production needs. The library community service is responsible for creating displays, planning and promoting library events, and writing book reviews to promote reading on campus. Students involved help librarians make decisions about which new books to buy and how to decorate the library for holidays and special themed months. The library also hosts special events in the evenings, and the library community service helps with both generating ideas and planning the events. Students volunteer in the Northeast Dutchess and Poughkeepsie communities on literacy needs, including tutoring adult English language learners at ESL classes in Pawling and Millbrook. There are openings for two student leaders to head the group as their community service obligation. They will attend ESL weekly, publicize the club’s efforts, recruit new members, and assist in creating curricular material. Are you interested in learning how to use software for layout editing? Do you like finding creative student work and sharing it with the community? Do you want to create and publish a literary magazine? Then this is the service for you! This is the new home for The Mill. Students in this service gather written and visual work from both students and faculty, organize what they collect, and then produce the magazine to share the content. This group performs a number of duties that keep the Mills Athletic Center functional for our students, faculty, and guests. From cleaning and organizing the weight room to processing team uniforms, we work with the athletic department to better serve our community. Other duties include preparing the basketball court, squash courts, and lobby for game day activities. This group provides music lessons in piano, drums, and guitar to children in the local community. Members of the Music Lesson CS are responsible for planning, teaching, and reflecting on their lesson each week. Each member will teach a minimum of 2 half hour lessons one evening a week in Holbrook. They will also meet at least once a week during community service block to plan their lessons and reflect. The group will also be responsible for advertising the lessons within the local community. We educate the members of the school community about human service needs that exist beyond the campus, and we help address some of those needs in the local area; we have collected and distributed used clothing and nonperishable food, and we have engaged in fundraising for charities. We have worked with Astor Home of Rhinebeck and Dutchess Outreach. We also participate in the NYC Midnight Run Program, Crop Walk and organized donations to Kiva. 16 Peer Counselors are chosen annually by the faculty Human Development facilitators and the outgoing Peer Counselors. The selected students provide emotional support in the dorms, and facilitate the IVth form Human Development groups throughout the year. The Peer Counselors meet as a group during the Tuesday community service block. This student will be responsible for photographing and editing student artwork for competition entries, summer program applications and documentation for the school. The student may choose to work outside of the community service block. He or she should have strong working knowledge of camera settings including aperture, shutter speed and ISO, Camera Raw edits in Photoshop, and continuous studio lighting. Ideally this student will have his or her own camera, but it will be possible to use a school camera if not. One student participates in the Poster CS each year, and that student handles poster design requests from the community. He or she may also design fliers, logos and other forms of communication design. This student should be proficient with Photoshop, Illustrator or other design software. He or she is responsible for communicating with faculty members who make requests and collaborating with the Printing CS to print the completed designs. This work can be completed during the CS block or during the student’s free time. Attention to detail is a must! This community service is in charge of the student Post Office, the sorting of mail for students, and the labeling of packages for the entire community. This service meets both during some of the community service block, as well as outside of those times. Students will be expected to sign up for three to four time slots per week. This student handles print requests from the community, including large and medium format prints from the two Epson printers in the photo studio. This student should be either familiar or willing to learn how to use each printer and file types/sizes. He or she is also responsible for communicating with faculty members who make requests. This work can be completed during the CS block or during the student’s free time. Attention to detail is a must! As a community we consume—and waste—an incredible number of resources such as paper, food, fuel and electricity. The mission of this service is facilitate the proper disposal of recyclable materials. The challenge is great, but even greater is the opportunity to make a significant difference in how, as a community, we make use of our resources. Join with us in one of Millbrook’s biggest and most active services, one which is particularly well-suited for day students because we have no night or weekend responsibilities. The service in the school store meets twice a week, typically once during the morning and once at night, to operate the cash register, to fold clothes, to help to restock items, and to assist the adult staff with projects from time to time. The people filling this position will be selected by the out-going editors and the advisor of The Silo. Often, Silo editors serve not as their official community service, but in addition to other positions on campus. The job entails managing staff writers, editing copy, assigning articles, making decisions about the journalistic priorities of the paper, and handling comments from the Millbrook community. It also involves the electronic publication of weekly The Stang. Editors report to the advisor of the paper. The people filling this position will be selected by the out-going editors and the advisor to The Silo. Often, layout editors serve not as their official community service, but in addition to other positions on campus. The job requires working knowledge of Adobe InDesign software. The layout editor must be absolutely reliable in meeting deadlines, often under pressure caused by late submissions to the paper. Work as layout editor will be done beyond the hours of the community service block. The layout editor reports to the editors. Silo staff writers, or "reporters," are expected to meet each community service block. They spend their time gathering information for stories (e.g., data, interviews), writing the stories, editing copy from other reporters, and helping to produce The Silo and its sister electronic newsletter, theStang, each week. Staff writers are selected by the in-coming and out-going editors, with supervision from the advisor. Staff writers report to the editors of the paper, but will be supervised directly by the advisor to the paper. The Tech Squad is responsible for supporting academic technology on campus. Each member of the team is responsible for several printers around campus, supplying paper to various sites on campus, and providing general technology help to the community. While previous experience with technology is a plus, it is not necessary. If you are interested in growing your skills and helping the community with technology, then this is the place for you! The Trevor Zoo, with its collection of more than 150 animals and eight endangered species, provides a unique opportunity for students to work directly with wildlife. Each student in the zoo community service is responsible for a particular animal, a group of animals, or preparing animal diets. Over the course of the year, a student receives three different animal assignments, thereby gaining a variety of experiences with the animal collection. Third formers spend one third of the academic year at the zoo as part of their rotation. Feeding is done twice on a daily basis (weekends included) by the student keeper. Working at the zoo requires dedication and responsibility and can be an extremely rewarding experience. Students participating in Millbrook's website community service assist the Communications Office in helping to maintain an effective, creative, and up-to-date website and social media presence for the school. They interview faculty and students, film athletics events and assemblies, create Snapchat geofilters and Instagram videos, and develop pump-up and recap videos for major events like Winter Weekend. Tutors selected for Millbrook’s Writing Center may request to fulfill this role as their community service. In addition to staffing the Writing Center on Wednesday evenings, tutors in this community service will be available for writing tutoring during two other periods each week. They will also work to update the writing center’s web page with up-to-date writing help materials, and assignments and rubrics from Millbrook teachers. This community service carries out the tremendous task of creating the Tamarack, the single historical document that represents a full year at Millbrook School. Students in this community service have two main responsibilities: First, the creative team takes and edits photos, creates layouts, and designs the “look" of the yearbook. If you have an eye for design or you’re comfortable behind the camera, this is for you! The administrative team manages all the fine details—organizing and tracking content, managing deadlines, and running the business of ad sales. If you’re all about the details, organizing ideas, and setting and meeting deadlines, this is for you! For all staff, opportunities for leadership abound! 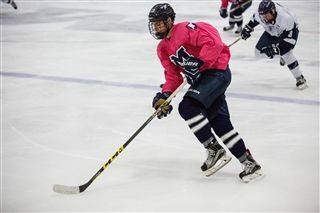 The Millbrook Kicks Cancer student organization and boys varsity hockey team combined their efforts this past weekend for a successful "Pink the Rink" fundraiser. 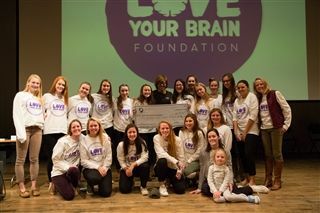 Kevin Pearce, a former professional snowboarder and traumatic brain injury survivor, addressed the Millbrook community in an all-school forum on December 4th. Students have been busy since the beginning of the academic year organizing service efforts that extend outside of our school community. Millbrook students and faculty participated in our annual Relay for Life event and raised over $5,000 for cancer research this past Saturday. Jen Hughes '17, Laura Toland '17, and Tess Toland '17 represented Millbrook at the 25th annual community spelling bee, which was held to benefit Literacy Connections on March 29. 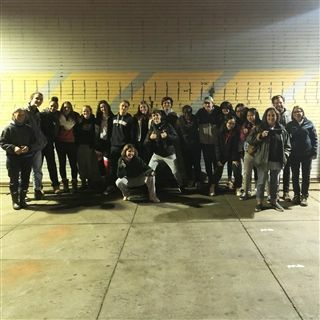 Eight V and VI form students traveled to Guatemala during Intersession with Headmaster Drew Casertano and Assistant Head of School and Dean of Students Liz Morrison for the 11th annual community service trip to Safe Passage. 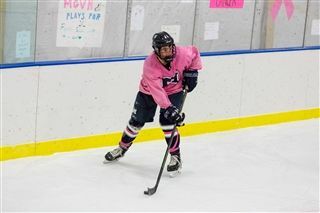 Millbrook's Junior Breast Cancer Awareness student group (JBCA) and boys varsity hockey team combined their efforts this past weekend for a successful "Pink the Rink" fundraiser. Students have been working together throughout the month of November to relocate the hoop house in Millbrook’s community garden. 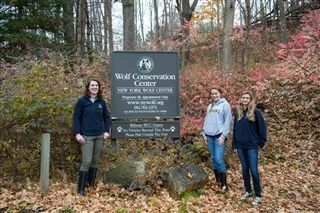 Corley deTuro ’18 and Tiffany Hatfield ’18 visited the Wolf Conservation Center in Salem, NY on November 6, to assist vets and other animal professionals in caring for the wolves. This week faculty members and 15 Millbrook students headed to India on a return service visit to work with students and educational organizations in need. Read a bit about their trip here, and then get the whole scoop on our blog! 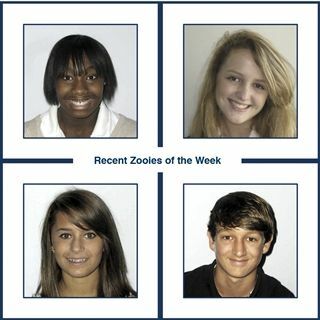 Spotlight on Community Service: Who's Your Zooie? If you were an animal at the Trevor Zoo, you would realize that zooies matter a lot... One of the 43 students who is assigned to your care holds your well being in the palm of his/her hand. If you want food and water, your zooie has to prepare and provide it. If you want clean shelter, your zooie has to rake, scoop, or shovel out the mess and replentish with the fresh. If you want enrichment and attention, your zooie has to take the time in the heat and cold, wind and rain, to play with you in manner appropriate for your species. Millbrook’s first forum of the year will focus on the power of cross-cultural relationships and the importance of educational access. Jen Ascencio '07 was a force to be reckoned with on the ice at Millbrook, and she continues to bring her determination and skill to bear for her current hockey team, the Manhattanville Valiants. 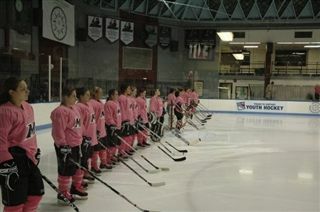 As of January 20, 2009, Manhattanville had its 12th consecutive victorywith a win over UMass Boston. This is the longest winning streak in Division III women's hockey and the second longest streak in all of women's hockey. 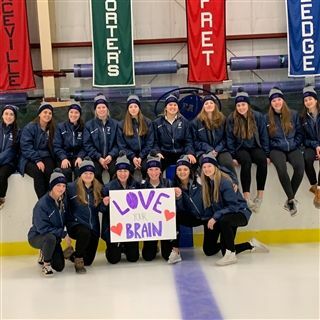 But thinking beyond the glory of their next win, Jenand her Manhattanville teammates were more focused recently on their collective power to contribute to a worthy cause. 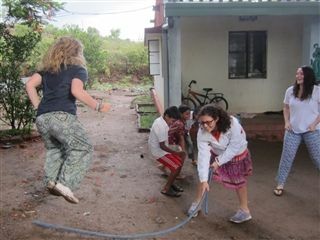 Hope was the overwhelming emotion that eight Millbrook students two faculty members felt after their first day in India. Over 16 days altogether they found smiles, optimism, spirit, and energy in places they never expected to.